Michael Blake's Homage to Pres and Hawk "Tiddy Boom"
Saxophonist Michael (not Mike) Blake is one of those artists who have a sustained appreciation of the tradition and for those who have come before him. In 1984 while still in Canada he had an opportunity to work with jazz stalwarts Cecil Taylor, Kenny Wheeler and Steve Coleman. The Canadian born musician has been a New York resident since1987. Blake paid his dues backing artist like Chubby Checker and organist “Brother” Jack McDuff among others. In 1990 Blake was catapulted into the eclectic world of multi-disciplined artist John Lurie and joined Lurie’s Lounge Lizards, a critically acclaimed group that included Lurie and his brother Evan, guitarists Marc Ribot and Dave Tronzo, bassist Billy Martin and trumpeter Steven Bernstein. The group has maintained a transient presence in the downtown New York music scene for over twenty resurfacing occasionally for special occasions. Blake also became the solo saxophone voice of the group Slow Poke and worked extensively in his own groups and in groups led by the progressive young bassist Ben Allison. 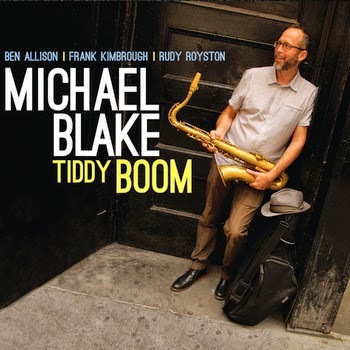 Blake’s latest release Tiddy Boom, is a reference to a phrase Blake once heard idol Lester Young call out to a drummer on a film clip. Pres asked the drummer to give him “a little tickity boom, please.” Blake proves that good, swinging music played in a style reminiscent of the old masters like Young and Coleman Hawkins can be just as powerful and compelling as it was when these iconic saxophonists were alive and wailing. Blake has mastered that deep throaty voice on his instrument that was popular when these giants ruled the bandstand. He plays with a legato sound that wrings the essence of a note out in a sultry, lingering way. This lushness can be heard on such songs as the loping “Skinny Dip,” and the rhumba inspired title song “Tiddy Boom,” “ A Good Day for Pres” and the beautifully paced “Hawk’s Last Rhumba,” one of my favorite pieces on the album for the resplendent sound Blake gets on his horn in homage to Hawkins. While the music is derivative it is never copied and the group backing Blake is superb. Ben Allison’s plucky bass lines strut majestically throughout and Rudy Royston’s tasteful cymbal work and feathery brushes are a delight. Pianist Kimbrough subtly shines with his piano accompaniment and he and Blake often have a sensitive interplay that is palpable, especially on the boppish “Coastline.” Kimbrough’s solo on “Letters in Disguise” is a swinging display of masterful keyboard work derivative but contemporary, and Blake breaks loose with a solo that shows he too is not stuck in a time warp. The jaggedly modern “Boogaloop” let’s you know these guys have progressed to a level of musical sophistication that has reached beyond their masters. The last composition titled “The Ambassadors” is a musical declaration from Blake and his cohorts that this music will always have its representation in the repertoire and these young lions will be both respectful ambassadors of that sound as well as creators of their own. There is something here for everyone. On Friday November 7, 2014, the Manhattan School of Music School’s Jazz Philharmonic Orchestra, under the able direction of maestro Justin DiCioccio, produced a river of sound that washed through the school’s Borden auditorium to a packed house of music lovers. entirety. The 2013 recording was among the nominees for the 2014 Grammy Awards in the categories of Best Instrumental Composition for Bound Away,and Best Instrumental Arrangement for Side Hikes: A Ridge Away. Both compositions are part five-movement concerto, combining a full symphony orchestra with a jazz ensemble and jazz soloists on violin, guitar and saxophone. The soloists were the tenor saxophone firebrand Donny McCaslin, the sensitive violinist Sara Caswell and the masterful guitarist Jack Wilkins. The music is an exhilarating compositional tour de force, combining the multiple musical voices, colors and timbres that a full orchestra can command with the individual jazz expressions of the featured solo instruments of electric guitar, tenor saxophone and violin. 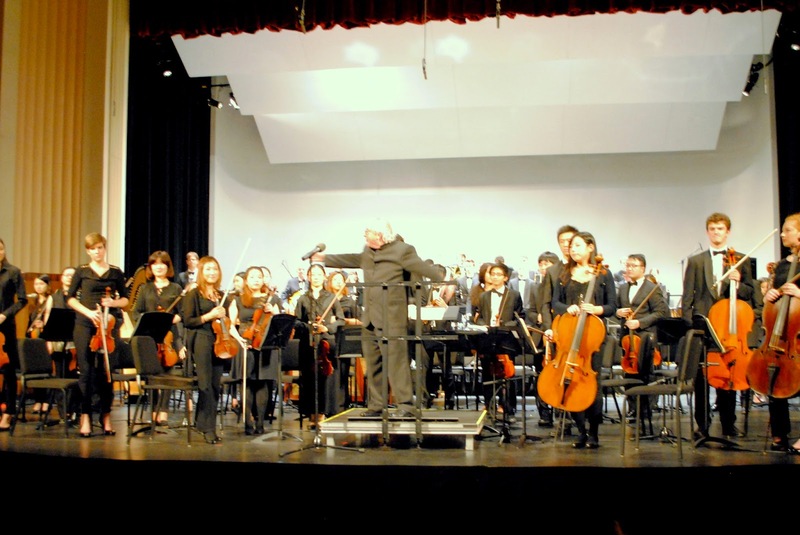 On this night maestro DiCioccio was exuberant in his direction of the music, as his orchestra produced brilliant tones and waves of sound that swept over the audience in the music’s ebbs and flow. The music was conceived by Mr. Owen as a representation of multiple adventure trips he has taken canoeing and rafting down various rivers in this country. Each movement is a musical depiction of various aspects of these trips. The opening composition “Prologue: Dawn’s at River’s Edge” is an impressionistic piece, all about the anticipation of waking up to nature in the early morning ready to embark on another challenging journey down the mysterious waters that lie ahead. The Grammy nominated “Movement I: Bound Away” is a musical recollection of the shimmering light reflected off the rippling pools of the Greenbrier and New Rivers of West Virginia. The trip meanders through a gorge where the thunderous sound of the approaching rapids is the clarion call that Owens' music recreates. “Movement II :Dark Waters , Slow Waters” is a representation of Owen's time on the Hillsborough River in Florida, A river edged with drooping cypress and lined with murky pools of ominous swampy waters. The music becomes much more tranquil as you go on a more languishing journey through the humid, moss covered banks of the Everglades. There is a sense of foreboding in this piece, an ominous feel of not really knowing what to expect around the next bend of the route. “Movement III : Chutes and Wave Trains” is a depiction of Owen's time on the Chatooga River as he makes his way down through Georgia and South Carolina. The music compresses and swells at times, similar to the way the water is compressed when funneled through a restrictive chute carved out of the architecture of the river banks; building up pressure and speed, only to be released on the other side of the obstruction, into the opening calm. “Movement IV: Side Hikes- A Ridge Away” This Grammy nominated composition is inspired from Owen's trips to the Green River in Utah and the Colorado River in Colorado, and was also adapted from the CD Ridgelines, a recording made by the saxophonist Jack Wilkins ( no relation to the guest guitarist) who was the featured saxophonist on the original recording. The unifying factor in both pieces is the concept of reaching a nearby ridge for an overview of your surroundings. Finally reaching the ridge you see many other ridges in your horizon, many never to be experienced, always just a “Ridge Away” from your reach. The composition appropriately creates a wistful sense of longing for the next great adventure. “Movement V: Perhaps the Better Claim: The River of No Return” With a line borrowed from Robert Frost’s haunting poem “A Road Not Taken”, Owen's chooses this title for a musical trip down Idaho’s Salmon River, a river known for its fierce rapids, its deep canyon, its treacherous terrain and its stunning scenery. The musical depiction sent the occupants of this auditorium-on-pontoons into a swirling and satisfying conclusion. The music was masterfully played by the MSM’s Jazz Philharmonic, who conquered the suite's demanding musical nuances, creating the atmosphere that so brilliantly depicts the natural musical sounds of the river rafting experience. The soloists were in top form. Ms. Caswell was particularly poignant when her violin was featured as a soloist and at times in counterpoint to her two fellow soloists. Saxophonist McCaslin is a firebrand of a player. He always brings a sense of energy and excitement to his work. He was particularly effective producing a "waves of sound” deluge that flowed from his horn much like the rapids of Owen's compositions. Guitarist Jack Wilkins was playing a Fender Telecaster through an amp and the sound was unfortunately somewhat muted from where I sat. Wilkins is one of those players whose technique is precise and immaculately clean; a consummate player whose melodic solos, (the ones I was I was able to hear clearly), were fluid, fleet and precise. His interplay with McCaslin was particularly noteworthy as the two fed off of each other brilliantly. Mr. Owen was in the audience for this performance and in speaking to him briefly afterwards he was obviously gratified to see his music performed so admirably. To be able to imitate the sounds of nature; to be able to magically reproduce the rapturous feeling one can get from communing in the woods on such an endeavor as white river rafting or hiking is an extraordinary achievement. I related to this album when I first reviewed it back in July of 2013 ( click here for a link to that review.) Now having seen it performed live by the MSM Jazz Philharmonic it only reinforces my original convictions. If you get a chance to see this work performed live and you enjoy commuting with nature you will not be disappointed with this brilliant piece of music.